An aging, out-of-work actress accepts one last job, though the consequences of her decision affect her in ways she didn’t consider. ‘The Congress’, Ari Folman’s follow up to the critically acclaimed ‘Waltz With Bashir’ is a strange beast, effectively telling one story for the first hour, before jumping forward 20 years in the timeline and telling a different story. The whole film however, belongs to Robin Wright (playing herself), in a deeply moving, brave and vulnerable performance, and her performance is the only thing attempting to hold the film together. The first hour is really good as it follows Wright’s aging actress (by Hollywood terms), when she is offered a one time deal to be digitally ‘scanned’ with her digital image rights being sold to her studio, Miramount (a portmanteau of Miramax and Paramount), in exchange for a large sum of money and on the condition that she never acts again. This part of the film covers a lot of interesting themes, from a satirical look at the direction film production is potentially heading in with technology, to a deeper and more resonant view on the treatment of older female actresses in Hollywood. Wright sells the hell out of her dilemma, and the finest scene in the film comes in the ‘scanning’ lab, when her longtime agent (played by Harvey Keitel), reminisces about their past together which subsequently helps Wright to go through the full range of emotions required for the scanning programme to work. The second hour is where things don’t work nearly as well for me, as we enter deeper sci-fi territory where new technology developed by Miramount allows people to transform themselves into animated avatars. The vast majority of this section is animated, and takes place in a bizarre cartoon world where people have transformed themselves into all sorts of people/creatures to suit their requirements. There are some points that Folman looks to make with this section, about the dangers of technology advancing at all costs and the ‘productisation’ of the human race, but the satirical barb isn’t nearly as sharp and his points don’t resonate as powerfully as they did in the first half. I found the majority of the animated section to be a slog, and it effectively ruined the film for me, which was a shame given how strong the opening section was. Folman does manage to pull together a few powerful scenes towards the end as Robin comes back to the ‘real’ world in search of her son, but it’s too late to save this section for me. 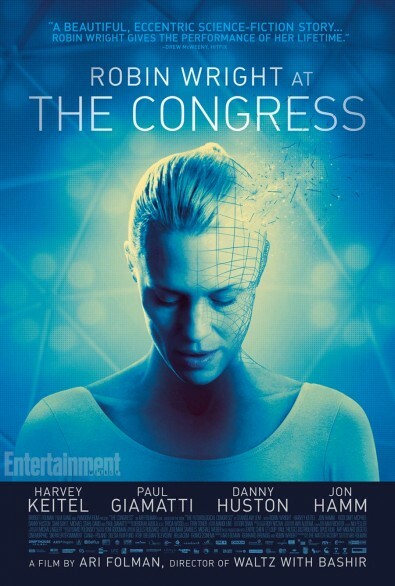 Overall, ‘The Congress’ is led by an outstanding Robin Wright performance, and has some interesting views on technology and the role of women in Hollywood, but it falls apart at the half way point, and never truly recovers the momentum. Ultimately disappointing.